Erlanger’s new Heart and Lung Institute offers many services, one of which is helping patients understand, manage, and prevent the cardiovascular ramifications of chemotherapy treatments. 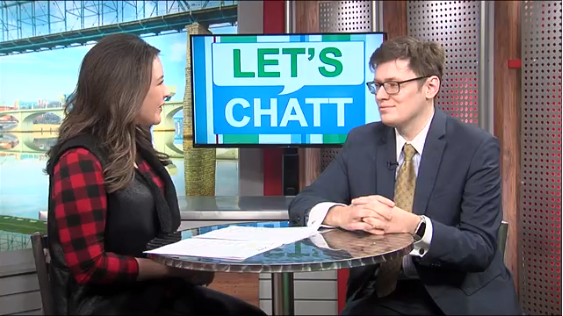 Dr. Patrick Stevens joined Jess Raby on Let’s Chatt to talk about the new Institute. Raby: You are a specialist with the institute. Tell me a little bit more about your role. Dr. Stevens: I’m a general cardiologist who also sees oncology patients. And it’s part of the team approach that we’re focusing on at Erlanger, which is bringing specialists from lots of different areas to treat the whole patient. I work with oncologists, radiation oncologists, nurses, nutritionists, and we try to provide the best care to oncology patients. What we found out in the last 10 years or so is now that we’re treating these patients so well and they’re living longer, that some of the medicines we give them can cause heart side effects down the road, or even as they get the medications. So I work with those providers to monitor patients, to try and treat them up front to prevent those events from happening. As an example, breast cancer patients are some people I work with quite frequently because some of those drugs can cause reduction in heart function, or heart failure. They can get radiation to the left side of their chest, which can have the heart in the field, and then down the road that can lead to issues with heart artery narrowing or heart dysfunction. Raby: It’s so important to stay up front and ahead of these issues. Because we really have to treat the original cause, right? We can’t just sit back and let it happen. So it’s so important to understand this information and be proactive about it. Dr. Stevens: I think a lot of this comes down to prevention, which is what we really focus on nowadays in cardiology. It’s better to prevent a heart attack than treat a heart attack that’s happening. And so looking at things like making sure patients are on cholesterol medicines at the right times, which maybe doesn’t seem like a big deal, but actually is because it can prevent heart attacks 10-15 years from now. Talking to patients about making sure that things like diet, exercise, all those important things that can help prevent things down the road. I think that’s what we’re really pushing for is prevention, as well as treatment. Raby: Knowledge is key, right? Raby: So talking a little bit more about the new Heart and Lung Institute. It just opened this past Thursday, but there’s been some anticipation and it’s been a long process. Dr. Stevens: Yeah, this has been in the works for several years now, we’ve had a lot of people working behind the scenes on this for quite a while and it was a really big accomplishment for Erlanger, and for the city, to have this type of facility open. It really allows us to provide cutting-edge care to patients, it’s a beautiful space, we have a lot of operating rooms and cath labs side-by-side, and again this goes toward your team approach, where you have surgeons and cardiologists working in pretty close proximity together, and if you have a question, there’s somebody right there who can come help. And that’s what we’re really pushing for is providing innovative care, and really working as a team. Raby: And having a facility like this here in Chattanooga, and having the team approach that Erlanger has, I don’t think people understand how important it is to a patient and a family unless they’re personally affected by it, but the opportunity to be able to stay here and to stay around your family. Where your family doesn’t have the travel or the patient doesn’t have to travel, that means a complete difference and actually can sometimes have an effect on the outcome. Dr. Stevens: Yeah, I agree. I think previously we’d potentially have to send some of these patients to other places, but now we can keep them here because we have this really cutting-edge technology and really beautiful facilities where we can really take care of these patients. A lot of things now are able to be done here, be done in a minimally invasive manner, so there’s faster recovery. One of the things we’re really working with now is minimally invasive gastric bypass surgery, so our cardiothoracic director Larry Shears has been working on that. So not having to cut open the chest, but doing the surgery through a small incision and decreasing the amount of time that it takes to recover. Raby: Wow, what a difference that will make. Well Dr. Stevens you’re fairly new with Erlanger, but we’re excited to have you here. What do you see as the future for the institute, and Erlanger as a whole? Dr. Stevens: I think trying to first establish ourselves as really a regional powerhouse, which I think we’re really well on our way to doing right now. We’ve got state of the art facilities and a lot of really great people. But I think trying to be recognized on more of a national level, and part of that is doing research, being involved in research, which is something we’re starting to really spearhead now. Doing clinical trials, and then just bringing in the best physicians we can and pushing that team approach, and I think that will really get us recognized on more of a national level, and that’s why we’re all here: to provide the best care to patients. Not just in Chattanooga, but everywhere in the state. Erlanger’s new Heart and Lung Institute opened its doors in February 2018. Learn more or book an appointment.